One Piece is a Japanese anime series. This series uses 37 different theme music, 19 opening themes and 18 closing themes. If you're a fan of One Piece, you won't want to miss any episode, and you'll want to download the episodes for review anytime you want. In fact, you have several ways to download One Piece episodes, and you'll find these methods are very easy to use. In this article, we'll introduce how to download One Piece episodes in detail. iTube Studio is a helpful One Piece episodes downloader which can help you to download videos from multiple anime video sites. 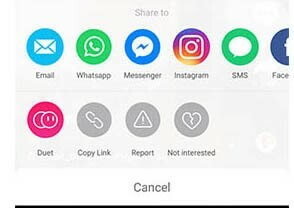 This software can also download videos from 10,000+ video sharing sites, and help you to transfer the downloaded videos to your mobile devices easily. In this part, we're going to introduce how to download One Piece episodes with KeepVid anime downloader in detail. 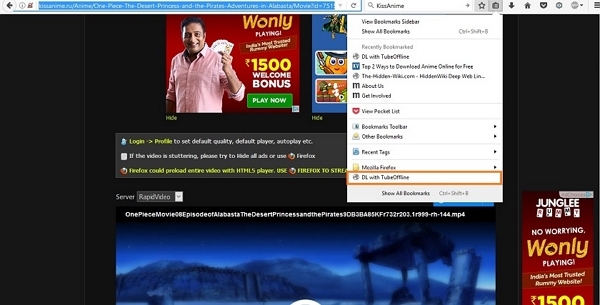 It helps you to download one piece episodes easily in one click only. It allows you to download videos from any site and you can also record videos from online videos sites. It can download one piece episodes in MP4 format and other 150+ formats. It you need to convert videos after downloading, then also it is possible with iTube Studio. You can transfer one piece anime download episodes to iOS and android using this software. We are going to download one piece episode from KissAnime website for example in this guide. Step 1 Install KeepVid anime video downloader on your computer and start it. Then you'll see the main interface of this program. Step 2 Now visit KissAnime website and search for “One Piece Episodes”. Select any of your favorite episode series from here. Step 3 You can either copy the video URL in the address bar, or click the Download button at the upper right corner of the video. Step 4 Click on “Paste URL” button in “Download” tab. Now the one piece episode download will start and finish in sometime depending on the size of the video. TubeOffline is an easy-to-use website where you can download One Piece episodes from multiple video sharing sites for free. 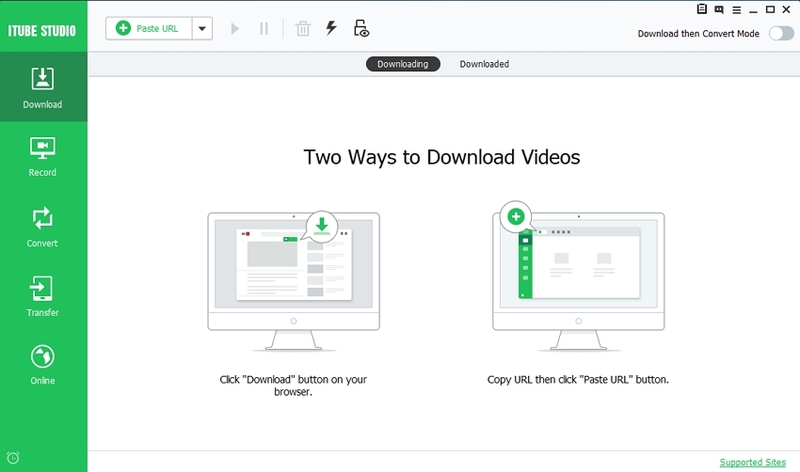 This website allows you to download videos without any installation of software or registration. With the help of this online anime video downloader, you'll be able to download One Piece episodes easily online. The following guide will show you how to download One Piece episode with Tubeoffline.com. Step 1. Open KissAnime and search for the “One Piece” in the search box. There click on any search result and then go to the video page. 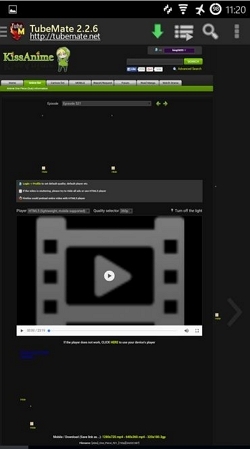 Once you are on the video page then copy video URL. Step 2. Open http://www.tubeoffline.com/ in the browser and search for Kissanime under supported sites list. Step 3. You will be there now on the kissanime supported video download page. 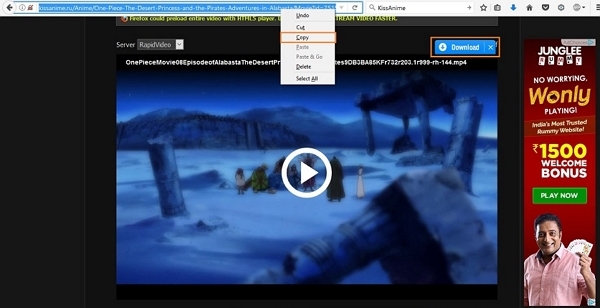 On this page paste the copied video URL of one piece episode in the URL section and click on “Get Video” button. Step 4. Now you will see another page. Drag and drop the bookmarklet to the bookmark bar from this page. Step 5. Now click on preview the file before downloading and then click on the bookmark bar. Finally click on the “DL with TubeOffline” option in bookmarks. Step 6. Now click on “Go To TubeOffline Download Page” option. Now you can download the video on the next page. Tubemate is an Android video downloader app for Android mobile devices which allows you to download One Piece episodes for free. This one piece anime downloader episodes app is able to download videos from YouTube, Dailymotion, KissAnime and a few other sites directly to the Android mobile and tablets. 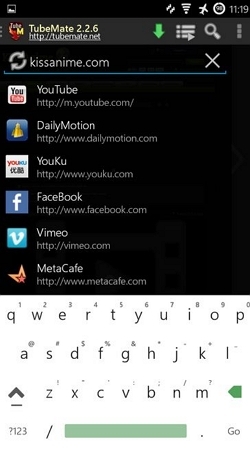 This is very easy to use app and directly gives you a download link when you open any video URL in the app. Step 1. Download the app apk file and install it on android. Now launch it and click on the gear icon on the top right side. Now tap on URL button. Step 2. Enter the kissanime.com and tap on go button on android soft keyboard. Step 3. Now you will be on kissanime website. In the search box search for “One piece” and select any episode which you like to download. Step 4. After selecting episode tap on the down arrow green color “Download” button on the top of app interface. Step 5. Select the quality of video downloading now and tap on “Download” button. 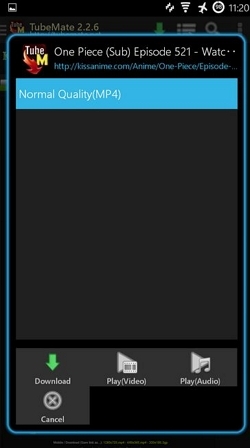 Now one piece anime episode download will start on your android. 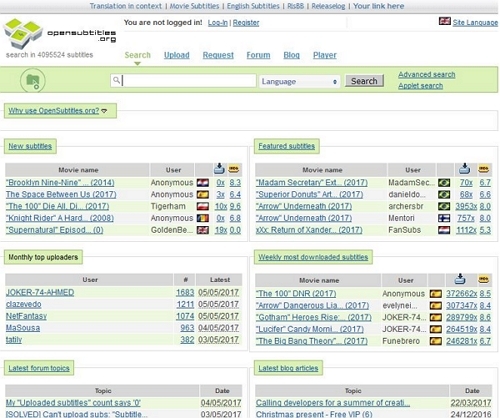 OpenSubtitles.org is subtitles sharing website where you can find subtitles related to any movie or TV episodes. This website shares subtitles of Hollywood, Bollywood and animation series. This website also has upload page where you can upload your own subtitles for free. It provides you subtitles in the .srt format. You can also request for new subtitles on the request page of website. You can download one piece anime free or any other movie of your choice from here. step 1. Open this subtitle website in the browser and you will see homepage of the website. step 2. 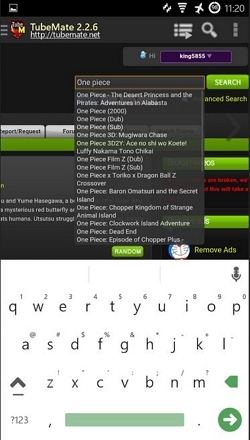 In the search box of website enter the search term "one piece" and then click on “One Piece” from the available searches. 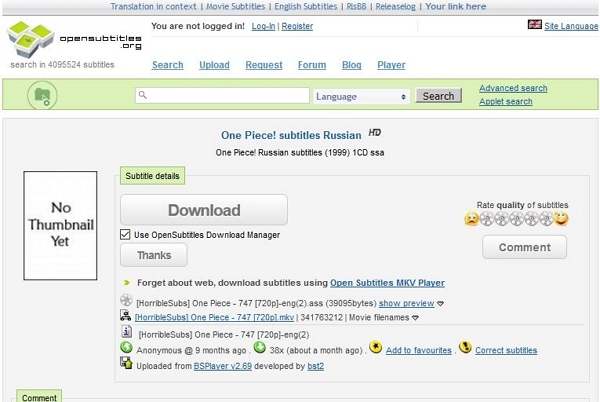 Now you can see all available subtitles of one piece episode. Click on any search result of your choice. step 3. Finally you can see a download button with the subtitle name on the next page. Click on this page and your subtitle file will start downloading. Downloading one piece episode in MP4 format is not much hard. The thing is you have to find out the MP4 video first then you can download it in the MP4 format. If your video is in the MP4 format then also you have to take care about the pixels of the video because pixels are the thing which makes video quality perfect. One piece episodes free download MP4 is possible from many sites but you must check the quality before downloading by previewing the video. Conclusion: We discussed about downloading One Piece episodes using different ways in this article. These all ways can work for you perfectly to download One Piece episodes. You can now download One Piece episodes in MP4 format on computer using software or any free way in this guide. 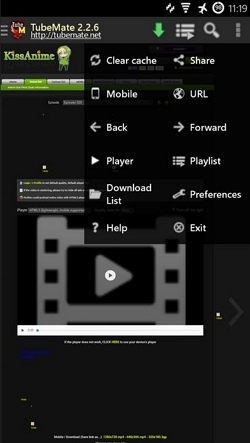 You can download videos on android mobile or download subtitles as well using the last part of the guide. 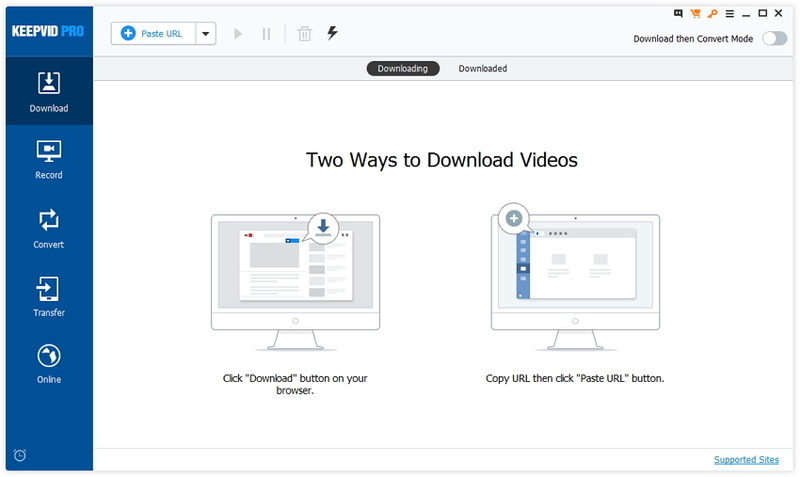 If you are looking to download videos on computer then we would like to recommend iTube Studio here because it helps you download videos from any site easily and conveniently.